Your robot milking system has the latest technology, shouldn't your milk cooling system match it? The integrated Mueller cooling solution is becoming a staple system on robotic dairies across the globe. 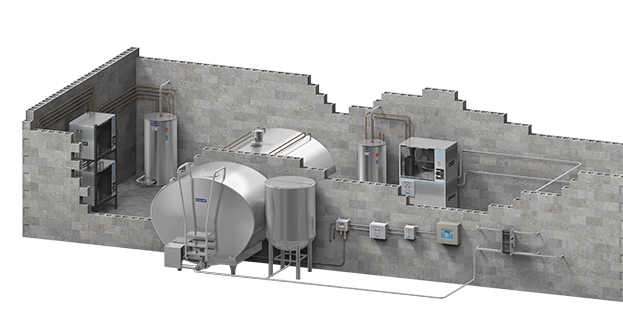 At Paul Mueller Company we have perfected this system to enhance the quality of your milk, while ensuring longevity in all milk cooling and storage equipment. Here's how it works—a single milk cooler and milk buffer tank is utilized. Milk is pumped into the buffer tank during the 1-3 hours it takes to pick up the milk and clean a milk cooler. As a quality enhancement measure the milk is instantly cooled to 36 degrees by the new HiPerCool A5 self contained chiller. The HiPerCool® A5 utilizes the HiPerForm® refrigeration technology the dairy industry has relied on for over 40 years. Prior to entering the buffer tank, the milk flows through the Accu-Therm® plate cooler first being pre-cooled with well water and then chilled to a set point with glycol water. This ensures cold and quality milk in the buffer tank. Buffer tanks do not have cooling capabilities, making instant cooling down to 36 degrees more important. This system does not require additional refrigeration. We are simply moving a portion of the cooling horse power from the milk cooler to the Accu-Therm plate cooler. If the milk in the cooler is not being picked up by the milk hauler and if the milk cooler is not washing, the 36-degree milk will be directed into the milk cooler where maintenance cooling will keep the product at the desired temperature. This simple but effective system has become the standard as the robotic cooling solution. As dairy producers think long-term about future growth, you will likely see more robotic dairies worldwide. Robotic dairies allow dairy producers more time for things they are passionate about: herd health, milk quality, and genetics to name a few. This way of life also promotes flexibility in a dairy producer's daily operations. This also means more quality time with family and friends. At Paul Mueller Company we are here to support your efforts with the most efficient storage and cooling equipment available. When designing a robotic dairy farm, request to review the right robotic cooling solution with your local milk cooling representative.